Eatsa's first location is in San Francisco's financial district. Its quinoa-based dishes sell for about $7 a bowl. 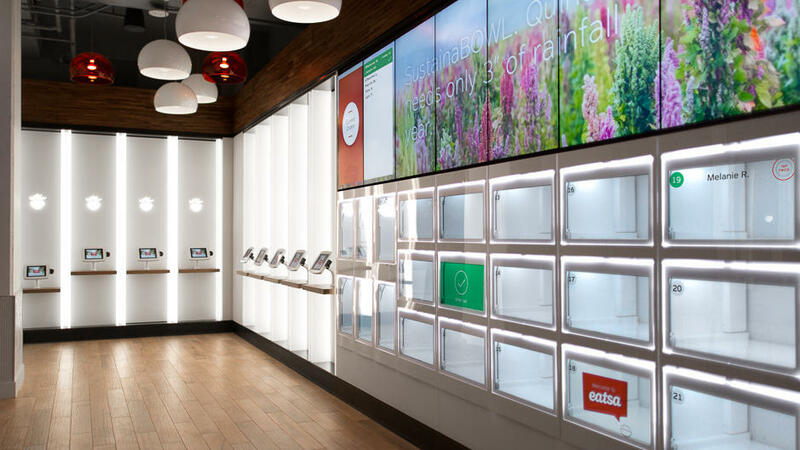 Eatsa's virtual cashier takes customers' orders and remembers them on return visits. It could be the latest sign that the industry is heading toward a more robotic future, a move some analysts say will be accelerated by the push to boost the minimum wage that so many fast-food workers rely on. 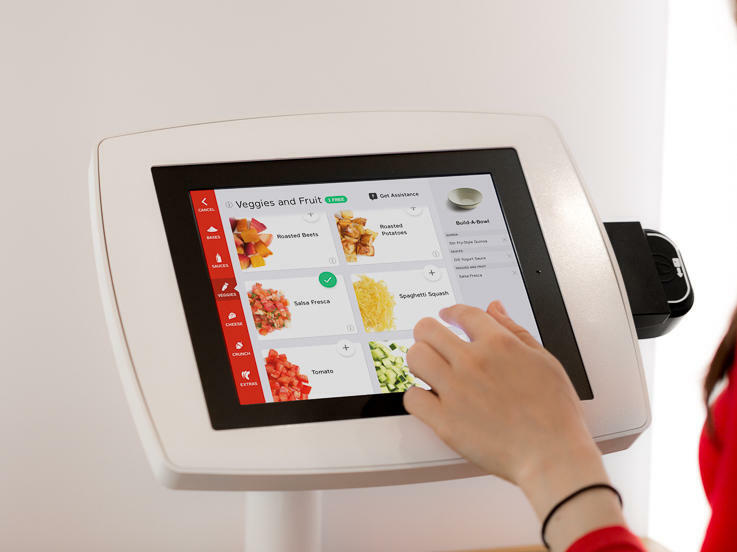 "With a virtual cashier and no wait staff, eatsa is a seamless, personalized experience utilizing kiosk stations and a cubby pick-up concept which provides food when customers want it," the company says in a press invite. "... it's fully automated, with all meal ordering done via in-store iPads. Not a human in sight, though there is a team of about five or six back-of-house kitchen staff (or as I like to imagine, magical elves) who are hidden from view and prepare the food. There's also one attendant on hand to help the tech challenged. "When your meal is ready — in just a few short minutes — it appears in small glass compartments, in a manner that's reminiscent of the classic mid-20th century automats." "They're called automats — restaurants where the food is served by vending machines. "Today, Amsterdam's Febo chain of stores feature only vending-machine service for burgers, fries and more. A few employees are responsible for stocking the items behind the machines but way out of customer view, so you can walk up, drop in your coins and get a hot meal after a long night out without talking to anyone face-to-face. "Japan also has a version of automats, known there as shokkenki. There, you choose the meal you want and purchase a ticket for it, then you hand in your ticket to the cook behind the counter. I guess this eliminates the role for the person who takes your order at the register." In using tablets to take orders, Eatsa follows both McDonald's and Panera, which have been experimenting with touch screens that customers use instead of speaking with a cashier. "McDonald's is not planning to pare down its work force as it adds the new kiosks to restaurants. "The kiosks could, however, allow operators to move some workers away from cash registers and into the kitchen to help speed up customer service." The same is true at Panera, Fortune reports: "The labor saved by customers placing orders digitally is being redeployed to beef up the workforce in the [kitchen]." "... he foresees a day when robots can perform many of the routinized tasks involved in assembling an order. But for now, Eatsa still needs a few good chefs, with some special skills. "They can't be afraid of technology," say Drummond. "Our first general manager used to be a military robotics specialist." Until the day the robots take over, the kitchen operation has also been rigorously engineered to root out inefficiencies ... "
Drummond's outlook echoes Martin Ford, author of Rise of the Robots, who in a Fresh Air interview described a robot being built for use in the fast-food industry. "Essentially, it's a machine that produces very, very high quality hamburgers," Ford said. "It can produce about 350 to 400 per hour; they come out fully configured on a conveyor belt ready to serve to the customer." "You have a several choices, among them a Mediterranean salad, a curry bowl, a burrito bowl, and a smokehouse salad. ... The pico could have used more salt, and I would have preferred less corn and more cheese, but the chips were fresh and the guac was particularly great."